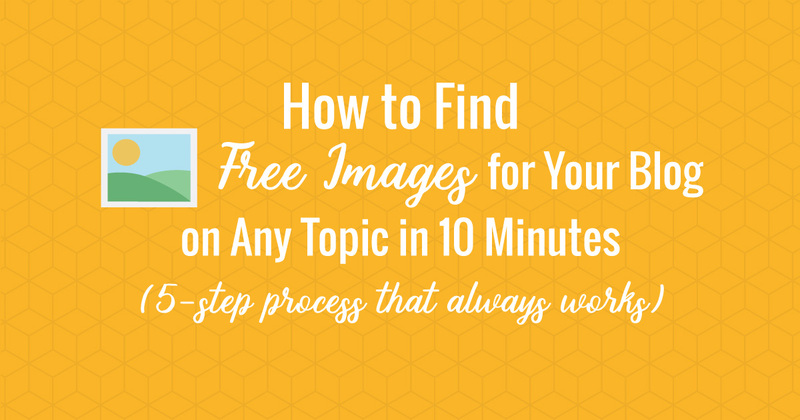 How to Always Find Free Images for Your Blog in Just 10 Minutes. Oh man! Not only do you have to spend hours writing your blog post. Now you also need another hour to look for free images to go with it! 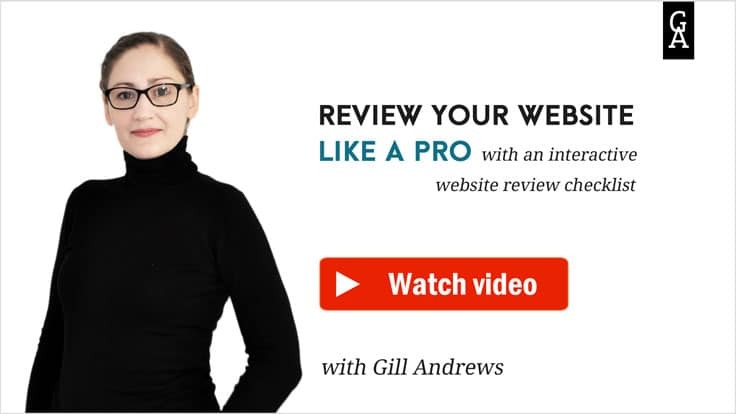 “When I’m rich, I’m getting a virtual assistant to do this for me”, you mutter to yourself while combing through royalty-free image website. Looking for free images for your blog can be an exhausting task. If your newly written article is about dogs, burgers, or tips on saving money, it’s a no-brainer. Your only challenge is to select from the numerous pictures of puppies, food, or cash. But what should you do if your blog post is about trust, values, or tolerance – something you can’t easily picture? Those websites don’t do well with abstract concepts. So you often feel frustrated spending too much time searching for an image. Although images on this blog are created from scratch, I have another blog where my visuals are based on the free images I find online. But if I had to rely on pure luck and randomly search numerous websites every time I need a featured image, I would be probably spending torturous hours doing nothing but that. That’s why I developed a quick process that helps me find free images to use in my blog post. If you do the same thing over and over again, define a process for it. It will save you time and brain power. This is my 5-step process that guarantees me a great royalty-free image I’m 100% happy on any topic with within 10 minutes. Google the title of your blog post, look at the image results and notice what images you like and what objects they depict. Search for the images of these objects on websites with royalty-free images. Search for images on Google that are labeled for reuse with modification. Search for the articles on the same topic as your blog posts, look at the images they use and objects they depict. Search for the free images of these objects on websites with royalty-free images. Here’s a detailed explanation and an example. 1. Google the title of your blog post. Google the title of your blog post and look at the image search results. Notice images you like and objects they depict. Example: This is how I found a free image for my blog post on how to spot a liar. I googled “how to spot a liar” and saw a couple of images I liked: A detective that looked like Sherlock Holmes and an image of Hercule Poirot. 2. Search for images on free images websites. Go back to websites for royalty-free images and search for the images of those objects. Example: I went to Pixabay.com and searched for “detective”, “sherlock holmes”, “poirot”. There are tons of websites with royalty-free images these days. If you want to see what else is out there, here’s a list of 23 websites that offer royalty-free images. But if you start going through each and one of them, you will again lose valuable time, and I’m not sure if the results will be worth it. That’s why I prefer to stick to just a couple of websites. Based on my experience, if I hadn’t found a suitable image there at this step, it’s very unlikely that I’ll find it on other 20 websites. But it will surely cost me a lot of time. That’s why when I don’t find a suitable image on these 3 websites right away, I simply go on with my process. 3. Search for free images on Google. Google for images labeled for reuse with modification using the same terms. For this, search for images on Google as you always do. Then click Search Tools -> Usage Rights -> Labeled for reuse with modifications. These are the images that you can freely modify and use for commercial and non-commercial purposes. Example: I searched for “poirot” and voilà, I found a great free image of David Suchet as Hercule Poirot. Note: I don’t start with this step because the selection of good free images I find on Google is much smaller. 4. Check the articles on similar topic. Google the title of your blog post, open a couple of articles on the similar topic and see what images they use. You won’t be using the same images, of course. Just notice what objects those images depict. Example: Let’s say I didn’t find my Poirot image. I searched for “how to spot a liar” and opened a couple of articles from the search results. Just 4 articles, and already 2 new ideas: a mask, and an eye! 5. Search for images on free images websites. Search for the images of those objects on websites for royalty-free images. Example: I searched for “mask” and “eye” on Pixabay. Take a coffee break or go for a walk and come up with more things that perfect image you are looking for could depict. Then proceed with Step 3. 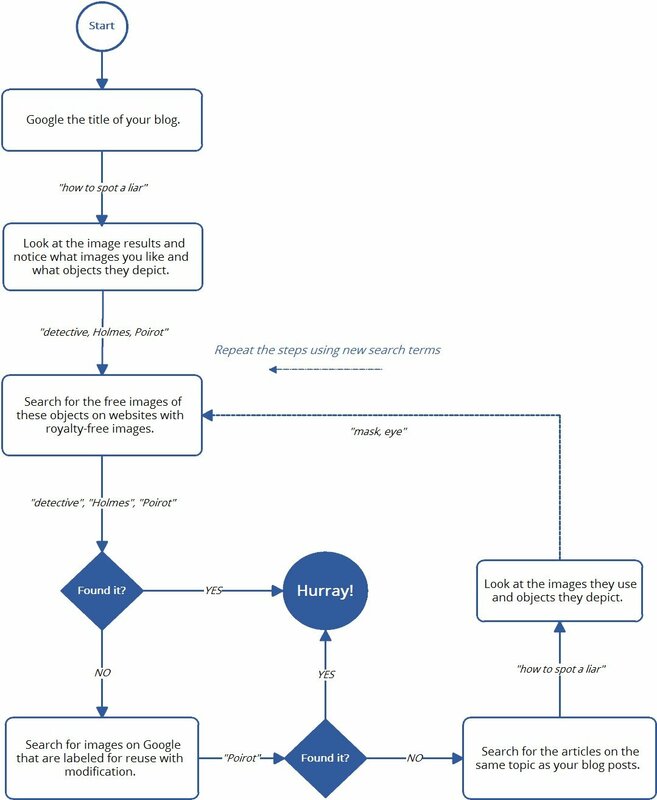 And when you follow this process and find your free images fast, you will have plenty of time to do other things, like for example create diagrams for your blog posts. P.S. Are you optimizing your images to keep the load speed of your website fast? Here’s an article about how you can optimize your images with no tools (even without a photo editor).